The Pheasant Tail is one of the classics among the nymphs and can be found in almost every fly box. 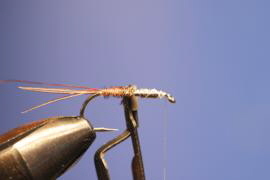 This nymph is available in many different versions. With the copper wire, a ground winding was made from front to back. With the last five wrap´s to the bent of the hook three tail fibers will be integrated, looking with the tips over the hook bow. Five more were added to the three fibers, but they were only tied in with the tips. 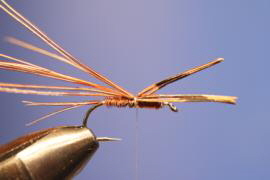 Now the copper wire was again wrapped tightly forward and formed in the front area by repeatedly wrapping the thorax. Now the body was formed forward , with the five fibers. At the thorax, the body fibers were tied in with the wire and the fibers for the wing sheaths were integrated. 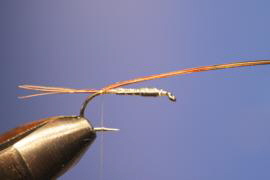 The wire with two large windings brought to the eye, then the wing sheath material pulled forward and caught with the wire. Two to three half hitches and done. In principle, today's tying is very similar, only with finer materials. By the way wire sounds very rough. I tied this pattern with 0.10 and 0.15 copper material, works fine. Since I like to fish deep, here is my version with lead weighting. 1. 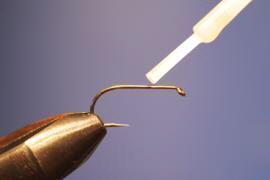 Apply a little superglue on the hook shank, easy to add exactly where you want it to be, with instant adhesive with brush. Here today's fly tying differs already to the olden days. 2. 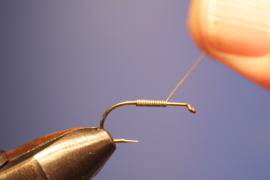 Start directly into the superglue with the lead winding and make sure that the winding lies to winding. 5. Next, tie in brass or copper wire for ribbing. 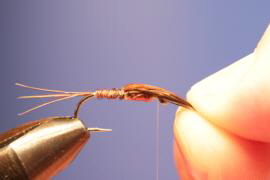 Make sure the wire is long enough to also form the thorax.